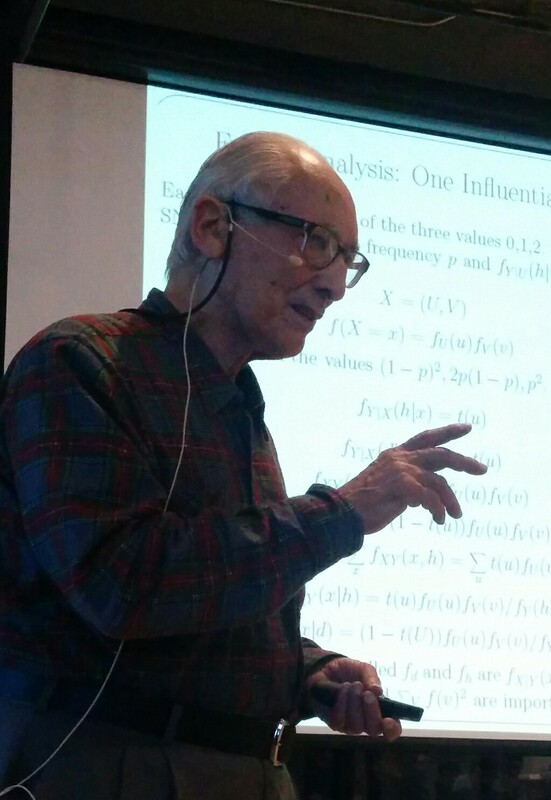 NESS would like to create and fund The Chernoff Excellence in Statistics Award on the occasion of Herman Chernoff’s 95th birthday to honor his outstanding, long-term contributions to the field of statistics. These contributions include work on large sample theory, experimental design, sequential analysis, methods of presenting statistical data in visual form, and statistical decision making. The annual New England Statistics Symposium was established in 1987 at the suggestion of Herman, which ultimately led to the establishment of NESS as a professional society in 2017. NESS is envisioned to be an engine to mobilize the abundant pedagogical and research resources in the New England area and beyond – and to promote and sustain the growth and expansion of statistics as one of the fundamental pillars of data science. A committee of at least three members will be formed, including at least one student or academia descendant of Herman. Each committee member will serve a minimum term of 3 years. New members will be nominated by current committee members and appointed by the NESS Council. New appointments will be made to avoid all committee members leaving at the same time, such that at least one existing committee member will continue for at least one more year. The initial committee can be appointed by the NESS Council. The responsibility of the committee includes (but not limited to) voting on the award recipient, fundraising for the award, and governing of the award fund. Current committee members: Joseph C. Cappelleri, James MacDougall, Mark Vangel, Bushi Wang. The Chernoff Excellence in Statistics Awards is the most prestigious award bestowed by the NESS, given to an individual who, in the tradition of Herman Chernoff’s work, has made exceptional contributions to the theory, methodology, or novel applications to statistics and/or data science. The Chernoff Excellence in Statistics Award will be rewarded to one recipient every year at the New England Statistics Symposium with travel expenses covered plus a minimum $500 honorarium to recognize researchers who have made a significant contribution to the field of statistical science. The first award is targeted for 2019. The award recipient is responsible for providing a current photograph and general personal information the year the award is presented. The New England Statistical Society will use this information to publicize the award and prepare the check and award certificate. The award recipient will be asked to deliver a lecture at the New England Statistical Society’s annual meeting. The award fund will be set aside and governed by the NESS Council and the award committee. Funding raised for the purpose of the Herman Chernoff Award will not be used for other activities of NESS. NESS Council may transfer the general fund of the organization to the award fund, but not vice versa. A separate log for fundraising and distribution of the award will be kept by the treasurer of NESS Council. The fundraising activity will be conducted to cover the cost of the award yearly. The award committee is responsible to make proposals should the amount of award need to be changed or additional fundraising is required. Proposals need to be approved by the board of the NESS Council. Initial funding of $30,000 is being sought for dedication as the initial endowment of the Chernoff Award. We hope that you consider making a generous donation to help set up the award. If you have any question regarding the award or donation, please contact NESS Vice President for Strategies and Development Dr. Joseph C. Cappelleri at joseph.c.cappelleri@pfizer.com.